During this season of shopping it seems an appropriate time to shed a little light on the history of one of the main shopping streets of Regency London. Though Bond Street is generally referred to as a single street today, in the Regency many people still made a distinction between the old and the new, though by then the pair of streets was already nearly a century old. In the late 1660s, an enormous mansion was built on eight acres of open land just north of Piccadilly for the powerful Earl of Clarendon, who had acquired the property by royal grant from King Charles II. Designed by Sir Roger Pratt, the great house is reported to have cost £40,000, and was described by Samuel Pepys as " … the finest pile I ever did see in my life." Clarendon House was purchased for £26,000 by the Duke of Albemarle in 1675, after Clarendon’s disgrace and flight abroad. However, despite having gotten the house and property at quite a bargain, the spendthrift duke was in dire financial straits within a few years. There had also been a disastrous fire which had caused extensive damage to the house after the duke bought it. In 1683, he sold the property and what remained of Clarendon House for £36,000 to a syndicate of wealthy investors which included Sir Thomas Bond, Henry Jermyn and Margaret Stafford, a lady from Northamptonshire. The investors initially had planned a square similar to the successful St. James’s Square, which had been developed by Jermyn’s uncle, another Henry, the Earl of St. Albans. However, after further consideration, it was determined that more money was to be made in ground rents from smaller properties. Therefore, what was left of Clarendon House was demolished and a set of streets were laid out, their names commemorating the members of the syndicate and those who had previously owned the property. Thus Albemarle, Dover, Stafford and Bond Streets were soon to be found stretching north from Piccadilly into the growing area of Mayfair. The original Bond Street was about two hundred yards long, running from Piccadilly to Burlington Gardens, which was the northern limit of the property of the Clarendon estate. It was completed in 1686. Once the street itself was laid out, buildings began to be erected along its length, some were residential only, while others consisted of shops on the ground floor with living quarters on the floors above. This is the stretch of Bond Street which would come to be known as Old Bond Street, after the street pushed north all the way to Oxford Street. The Conduit Mead Estate, which belonged to the City of London, had been acquired by the City’s Corporation in the fifteenth century to secure and protect the conduits which supplied the City with water. This tract of land was just north of the Clarendon tract and in the early eighteenth century, it began to be developed. Just after 1700, Bond Street was extended a few blocks north, onto the Conduit Mead Estate tract, but here development halted for a score of years. It was not until the great boom of building in 1720s London that Bond Street finally reached its full length. This new, northern section of the street, running from Burlington Gardens to Oxford Street was then called New Bond Street. The completed Bond Street was the only street which ran through the full depth of Mayfair, north to south, from Piccadilly to Oxford Street. Most of the buildings which went up along New Bond Street were shops, with residential space on the upper floors. Within a decade, a number of fashionable shops had premises along Bond Street. More importantly, there were also pavements constructed on either side of the street. These stone walkways, raised above the mud and muck of the roadway, quickly became a popular promenade venue for many of the beau monde of Georgian London. The tale is told that one bright day in the late eighteenth century, Charles James Fox and the Prince of Wales were strolling down Bond Street when Fox, ever fond of gambling, wagered with the Prince as to how many cats might be seen on each side of the street. Fox, a clever and observant man, choose the sunny side of the street and handily won the wager with a total of thirteen cats on his side of the street to none on the Prince’s side. Most people who strolled down Bond Street, however, did so to see and be seen, as well as to shop, rather than to wager with royalty on feline demographics. Mention of course, must be made of the Bond Street Loungers, a set of young men who, during the latter part of the eighteenth century and into the Regency, spent much time on the pavements of Bond Street perfecting their distinctive walk, known as the Bond Street Roll. Many young men who wished to be thought fashionable devoted many hours to imitating this unique gait. Though Old Bond Street was originally laid out in the seventeenth century, it was not until the eighteenth century that shopping began to become a popular pastime for members of the upper classes. In particular, shopping for stylish and elegant luxuries. Shopping for food and other necessities was still considered a chore to be consigned to the servants whenever possible. Many of the purveyors of the luxury items sought by the beau monde located their shops along Bond Street to be in close proximity to their best customers. The convenient location, the concentration of fine shops and the stone pavements which protected them from the roadway dirt combined to become a powerful draw to the ladies and gentlemen of the ton. Bond Street, particularly New Bond Street, was considered to be the most fashionable shopping street in London from the eighteenth century right through the Regency. And it continues to retain its pre-eminence as an exclusive shopping area to this day. But all those rooms on the floors above the shops were not just relegated to the dwellings of the shop-keepers. Bond Street was a fashionable residential address and many shop-keepers let some or all of their upper rooms to distinguished lodgers, including Dean Jonathan Swift, George Selwyn, Edward Gibbon, William Pitt the Elder, Henry Fielding, Laurence Sterne, Sir Joshua Reynolds and James Boswell, most of whom lived in Old Bond Street. Some of those who took rooms in New Bond Street include Sir Thomas Lawrence, Sir Walter Scott, Admiral Lord Nelson, and later, in a different house, Lady Emma Hamilton. By the end of the nineteenth century, Bond Street had become increasingly commercial and was no longer considered a fashionable residential area. But during the Regency, it was particularly popular with single young men about town. Services as well as goods were available on Bond Street during the Regency. At Number 13 Old Bond Street could be found the famous studio where the athletic young bucks could take boxing lessons, if they were very good, from the champion pugilist, Gentleman John Jackson, himself. Just next door was the fencing academy established by Henry Angelo, senior, a good friend of Gentleman Jackson. Henry Angelo, junior, would take over management of the fencing academy upon his father’s retirement, in 1817. A few select gambling houses had premises on Bond Street during the Regency. There were also several discrete brothels, known as "sporting hotels," to be found along Bond Street, which catered to wealthy gentlemen. These establishments did not hang out signs, but their clients knew where they were located. The existence of these clandestine establishments were probably the reason that it was considered improper for well-bred young ladies to be seen in public on Bond Street after mid-day. Even when there early in the day, these young ladies must be accompanied by a chaperon. Bond Street was certainly the most fashionable shopping area of Regency London. The best dress-makers and tailors, jewellers and boot-makers, tobacconists and haberdashers all had well-appointed shops along that street. However, the overtly masculine atmosphere which prevailed along that street meant that young ladies, certainly gently-bred, unmarried ladies, must always be accompanied by a chaperon and must not be seen in public along that street anytime after mid-day. But keep in mind that mid-day in the Regency did not mean high noon, as we would assume today. Rather, young ladies would be expected to make themselves scarce by four or five o’clock in the afternoon. At that time, they should be strolling or driving through Hyde Park, or on their way home to change for dinner and their evening activities. They should most definitely not be seen strolling along Bond Street for any reason as the dinner hour approached. Mornings (in the Regency, the time between arising and dinner) on Bond Street belonged to the ladies. The remainder of the day on Bond Street belonged to the gentlemen. This entry was posted in Places and tagged Clothing, Etiquette, Jewellery, Regency, Time. Bookmark the permalink. Good information! My ggggggfr Philipe Metivier had a haberdasher’s shop at 29, New Bond Street in the 1780’s. Wish I knew more about him…. I’m dropping in to thank you for this site. I’ve been going over your old articles, especially the ones about transportation and apparel. This is wonderful. Better than reading any single book on the Regency era – though I should probably read several if I ever want to get a good grasp on the period. But again, thank you. Thank you for stopping by and for kind words. I am glad you are finding the articles here useful, that was my hope when I began publishing the Redingote. In terms of researching the Regency, it can be quite a challenge, since that period was so short. There are very few books written just about the Regency, so I read a lot of books which cover broader periods that include the Regency. 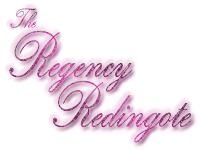 Then I pull out the Regency-specific details to include in my Redingote articles. As with this article, I often include a longer time-line, just to help set a subject in context. Even when writing a book set in the Regency, some of the characters may be older, even elderly, and will, or should, have memories of people and places from an earlier time. Pingback: Starting my series of Best Places to Visit in London, UK, and will doing lots on the Best Historical Places in England, but will also be hopping around the globe to other continents. Mayfair is in central London, UK. Mayfair is named after the fortnight-long May Fair that took place there from 1686 until it was banned from that location in 1764. (Before 1686, the May Fair was held in the Haymarket; after 1764, it moved to Fair Field in Bow). The area was owned by the Grosvenor family and much of the land is still part of the Grosvenor Estate, having been originally developed for residences from the late seventeenth century. This is an extremely well-heeled district, as symbolised by its appearance as the most expensive property on the London Monopoly board, closely followed by one of its main thoroughfares, Park Lane. The district includes several major shopping streets, including Bond Street, Regent Street, Jermyn Street and much of Oxford Street. Found this really interesting, one of my ancestors lived as a housekeeper down new Bond Street in 1891 & 1901 trying to find a bit more about her & who would have owned the house. She is on the census as the housekeeper along with various women listed as dressmakers – or could it be that in fact this was one of the @sporting hotels’ ?! If all the “tenants” of the house were female, I think it is possible that there was more going on there than the making of clothing. However, I don’t want to unfairly slander those ladies, since it is also possible they choose to live in a “ladies only” building in an effort to protect their respectability. They might also all have been doing piecework for a contractor, possibly also the owner of the building, though that seems less likely on Bond Street. I wish you luck in your research! Your ancestor sounds like a very interesting lady. If she did have illegitimate children with a member of a wealthy family, it is possible they paid her to hush it up. Though many Regency men did not seem to care if anyone knew they had illegitimate children, Victorian men, and their families, seem much more concerned with appearances. But you never know what persistent research may reveal. Hello, do you know if number 74 New Bond Street, is the original house from about 1811. My gr-gr-gr-grandfather was Thomas Day Huntly who was an engraver and stationer. He and Elizabeth nee Allen had 11 children there. He died in 1832 but she stayed on for another twenty years or so still running the business. I’d love to know if the 74 New Bond Street of today is that original building. No, I am sorry to say that I have no detailed information on any specific building along either Old or New Bond Street. Having names of residents of the building should help you with your research. You might want to check with the British Library or the Museum of London. They might be able to give you some pointers on how to find the most useful records to research the history of that location. If you do not live in the London area, then your best bet is probably to talk to the reference librarian at your local library. They should be able to help you locate records which will give you more information about the building in which you are interested.